Why has Maa’loula, Syria’s most famous Christian village, suddenly found itself caught up in the Syrian war? Like most Christian villages, it has stayed neutral from the beginning, trying not to be drawn onto one side or the other. Why should it happen now? Maa’loula is of no strategic interest to the rebels, set as it is in a cleft under a cliff with only one way in and out. Only the Qalamoun Mountains above the Christian town are of interest as strategic high ground from which to command surrounding areas. The regime has controlled a big and well-armed checkpoint at the entrance to Maa’loula for a long time, but last week it started firing up at rebel positions high above Maa’loula, provoking the rebel attack on the checkpoint. The regime then began shelling the town to displace the rebels, and the story hit the papers. Residents of Maa’loula were understandably frightened and distressed, feeling they had to leave and take shelter in Damascus. Conveniently, the BBC’s Jeremy Bowen had been given a regime-approved visa to be in Damascus, and was there to interview and film the fleeing Christians. Headlines across the world soon became ‘Christians in Maaloula forced to flee homes and houses looted by rebels.’ YouTube videos uploaded afterwards showed some damage to the Hotel Safir at the top of the cliff and to some residential buildings. The two famous monasteries were undamaged. The facts here are strange for their timing. It is extremely lucky for the regime to have such headlines at present, to give weight to the anti-US intervention campaign, to make the rebels look as if they are targeting Christians. But why would the rebels do that? In the entire course of the Syrian civil war, the overwhelming majority of people killed have been Sunni Muslim. There have been no reciprocal massacres of Christians or Alawites by the rebels. If they had wanted to target Christians they could have done so months or even years ago, desecrating churches and knocking down crosses. Instead, many rebels have been actively helping Christians and protecting them wherever possible. 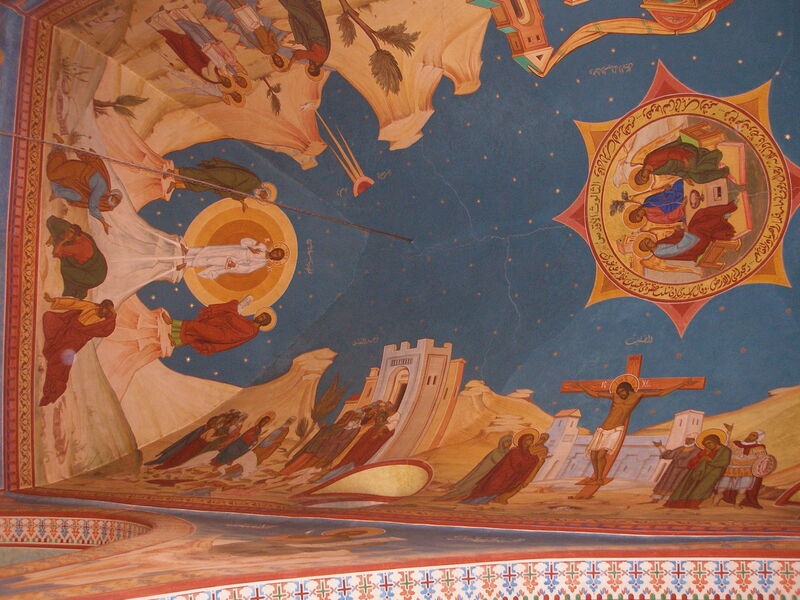 In Qara, a little north of Maaloula the Christians are helping the rebels. In Homs the rebels are guarding the churches and the frescoes inside have not been damaged. Only the external fabric and the glass has been damaged by the regime shelling. They are even protecting the 35 or so Christian families who are still in Homs, too old or too poor to leave. But none of that makes headlines. In Maaloula, beside the two famous monasteries of Mar Serkis and Mar Thekla, whose shrines are visited by Christians and Muslims alike in search of miraculous cures like a kind of ‘Lourdes’, there are 6 further churches and 2 mosques. The community is predominantly Christian but is also mixed. 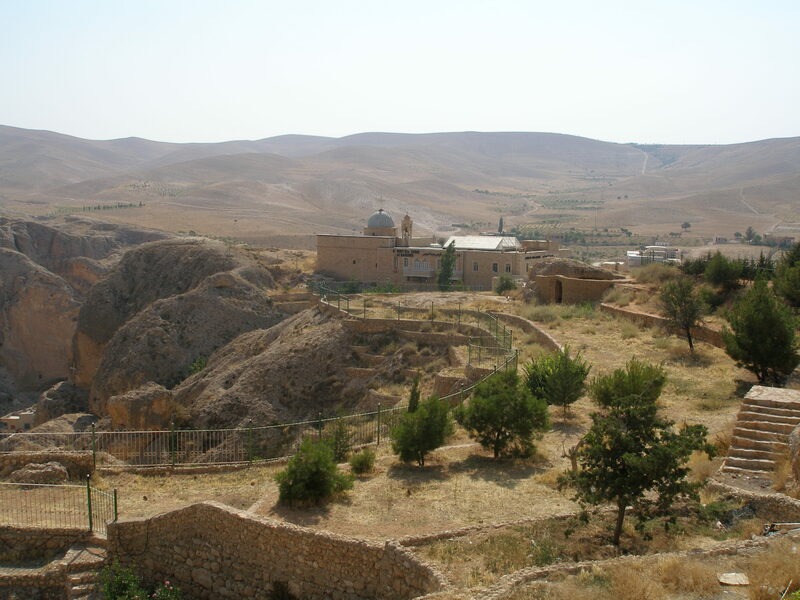 In Seydnayya, another famous monastery a little to the south just on the edge of the Qalamoun Mountains, the shrine is also visited by both Christians and Muslims, again seeking cures to illness and disease. In the town there are 13 further churches and 2 mosques. Two Christian women in the town are married to Muslim men. These communities have lived side by side for centuries. Now however the regime is in a very tight spot, with the threat of an American-led attack. Bringing to the forefront of the world’s consciousness a strategically insignificant but historically significant place like Maa’loula, Syria’s most famous Christian village well known to tourists as the place where the nuns will sing ‘The Lord’s Prayer’ for you in Aramaic, ‘the language of Christ’, is a very clever ploy. The regime has learnt well from the American and British PR firms it paid so handsomely to advise it on ‘image enhancement’ before the revolution broke out. Better trained and better funded, they are winning the PR war. fistulae, prematurely, stillbirth, and sexually transmitted diseases (including cervical cancer). some jubilation that: “Those of us who can sort, digest, synthesize, and apply relevant knowledge soar — professionally, financially, politically, militarily, and socially.